Early this summer I mentioned that Cupcake Royale was going to be hosting preserving workshops with the modern canning guru, Amy Pennington. I put it on my calendar and each month something came up, so I never made it. I’m still kind of bummed about that, but I was excited when I found out that Amy was coming to me, or rather to my local public library. It was a really great book reading and lively Q&A. She even brought us homemade buttermilk cake! I was completely in heaven with cake and so much good information. We bought her new book Urban Pantry: Tips & recipes for a thrifty, sustainable & seasonal kitchen. I’ve bought several new cookbooks lately and this one tops the list with some delicious and very approachable recipes. I paged through it bookmarking the recipes that I want to try, so far we’ve made the buttermilk cake, and last night I made a roast chicken and used the bones to make chicken stock for the freezer. That is totally me! I don’t know any twenty-somethings that get as excited about local produce or a new spatula as I do. I’m glad to know I am in good company! So this buttermilk cake, I keep telling everyone about it and you wouldn’t believe the faces people make! Apparently buttermilk and cake aren’t supposed to go together. 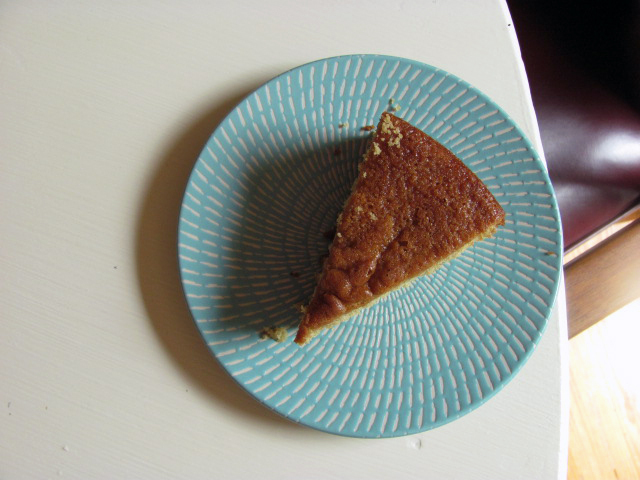 This has to be one of the easiest cakes I’ve ever make, and it is light and slightly sweet that it is perfect with a fruit syrup or a dollop of jam. I hope she doesn’t mind me sharing it with you because you need this in your recipe arsenal, but you also need to go out and get this book so you can try all of the other amazing recipes. At the book reading Ms. Pennington brought this cake, with little dollops of her jams and sauces. In the cookbook, page 125, it is a chocolate buttermilk cake. When I tasted some sweet little plums at the market I knew I wanted to make a sauce to go on top so I also skipped the cocoa powder, but next time I think I’ll try the chocolate version. Just add a 1/2 cup of cocoa power to the dry ingredients. Preheat oven to 350º. Butter 9-inch cake pan really well. Combine flour, baking powder, baking soda and salt in a small bowl and set aside. Stir together the butter milk, cognac and vanilla, set aside. In the bowl of an electric mixer, cream the butter and sugar until light, white, and fluffy. Add the eggs, one at a time, mixing well. Add half the dry ingredients and mix until just combined. Pour in buttermilk mixture and blend well. Add the remaining flour mixture and mix until just coming together. Pour batter into prepared cake pan and bake for 30-40 minutes, or until a toothpick comes out clean. Cool on a cooling rack and serve with jam, syrup, or preserves. Pit and slice a handful of ripe, fresh plums. Toss with a tablespoon of sugar in a heavy bottom sauce pan. Cook covered on low for 20-30 minutes, until the fruit breaks down. At this point you can fish out the skins, but I was lazy and just left them. Add a splash of red wine and cook for a few more minutes with the lid off until it cooks down to a syrup consistency. Taste and add more sugar or wine to taste. 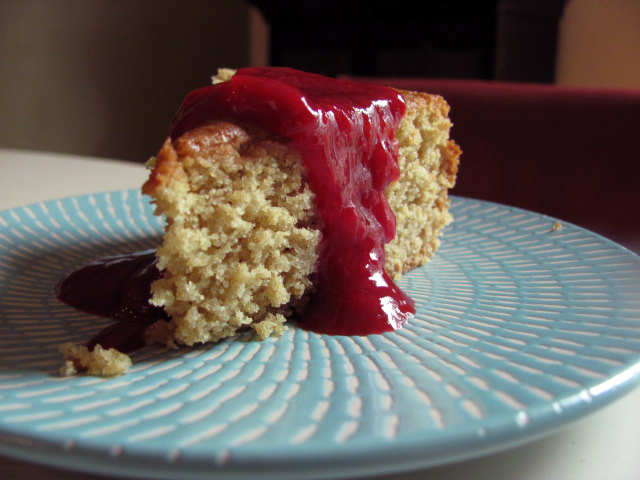 This entry was posted in Cakes & Cupcakes, Cookbook, Dessert, Fruit, Preserving and Canning. Bookmark the permalink. Liz! I totally want to try this! thanks for sharing. p.s. do you think it would be possible to substitute half a cup of flour for half a cup of ground almonds? or do you think that wouldn’t fit? Larissa, I bet you could, for sure! Will change the texture a bit – will not be as light and airy. And I would love the cocoa in that almond meal cake, too. Also, best to only substitute 1/4 of the flour with a nut meal, and this is true of most any recipe. Equal parts nut and flour may be too heavy. Keep us posted on the outcome!